The day begins at 9:00 when our chauffeur will pick you up at your hotel for the first stop on your tour, Siena, often called Tuscany's most beautiful hilltown. There you will meet your expert guide for a tour that will highlight the major monuments of this historical city including the stunning the Piazza del Campo where the great horserace "the Palio" has been held every year since the dark ages. Next visit the Palazzo Pubblico and the intriguing cathedral complex that is home to a collection of the works of art by Michelangelo, Donatello, and Bernini. Say goodbye to your guide and drive through the Sienese hills to San Gimignano, called the "Manhattan" of Tuscany for its 15 medieval towers. Stop for lunch in one of the local trattoria, then stroll the streets of this charming town and enjoy the afternoon on your own. Make sure to see the Piazza della Cisterna and the Piazza del Duomo. Take a peek at the local wares and wines in the shops that line the cobblestone streets, before returning to your hotel by 5 p.m.
We will head southeast to the first Renaissance town of Italy. Pienza, renamed after the Piccolomini Pope Pius II, is a tiny jewel box well worth exploring. We will visit Pius' Papal Palace and have free time to wander through the quaint streets such as Via dell'Amore, Via del Bacio, etc., before heading to a Cistercian abbey to listen to Gregorian chants in situ. 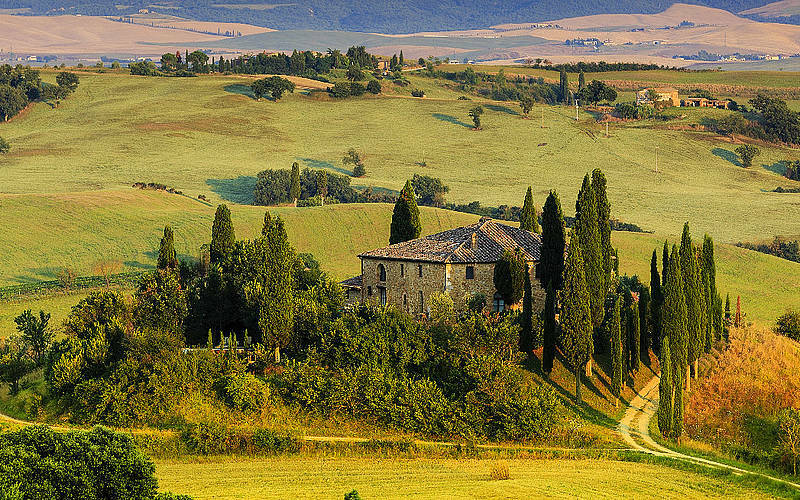 Afterward, we will conclude this magnificent excursion in Montalcino at a world-famous winery for a tasting of some of the finest Tuscan wines.